Pleasant Valley Community Fire Company has established an endowed scholarship fund in honor and memory of their life member, Robert Fogle, III. He died in the line of duty in 2014 at the age of 58. The endowed fund was announced prior to the college’s monthly board meeting on Feb. 15, 2017. 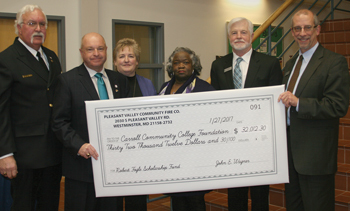 The donors presented a commemorative check that evening, following remarks from College President Dr. James D. Ball. Initially, two $600 scholarships will be available annually, an amount that is expected to grow. The scholarships are available to students who are majoring in an area of study that leads to a career in public safety. The dedicated firefighter was a 31-year member of Pleasant Valley. He was also a 27-year member of the Baltimore County Fire Department. He was a University of Maryland MFRI instructor working with the Carroll County Emergency Services Training Program, where he taught fire and EMS students. He was an avid golfer and the funds to initiate and perpetuate the scholarship will come from the annual golf tournament hosted by the fire department. A check is presented to establish a scholarship in honor of Robert W. Fogle III.